after posting the previous Cow in the fog, I realised that I had posted the wrong image. 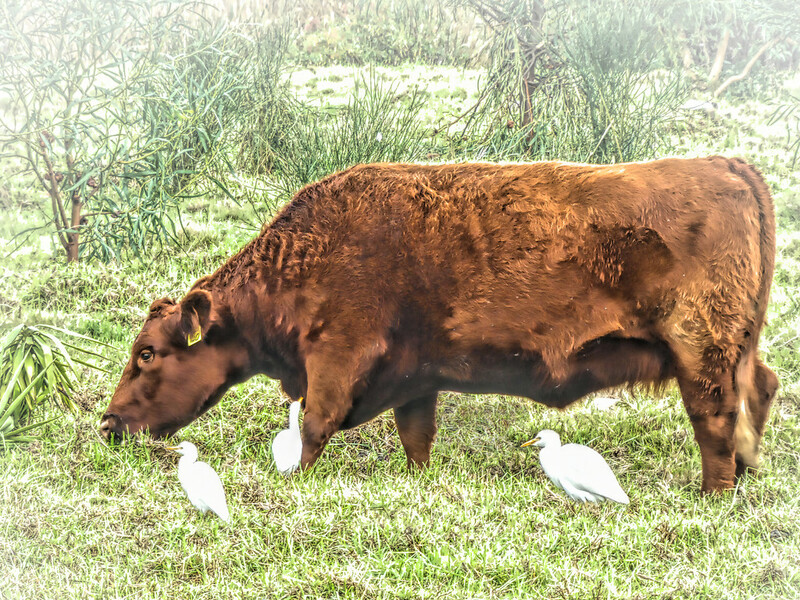 Cattle always have lots of egrets following them don't they. Looks like a nice warm coat! Oh my, three cattle egrets! This is great. Beautiful shot. A great scene with that magnificent bull and the egtets. Beautiful animal. The egrets seem to like him too. Nice!! Thats a big Cow! Lovely shot. Nice plump looking animal. I know in this country we tend to refer to all cattle as cows, irrespective of gender, but I think perhaps this one might be a bull? Beautiful scene , capture and editing. Great cow, nice birds. @onewing @suzanne234 @paul10 @hermann @pusspup @louannwarren @sangwann @henrir @julienne1 @brillomick @tonygig @seacreature @fayefaye @rosiekind @snowy @pyrrhula @amyk @milaniet @rickster549 @bkbinthecity Thanks for the great comments, fav's and getting it on both the TP and PP. It is very much appreciated.